It is said that the best way to learn is through play. Toy giant LEGO proved the old concept works when it invited kids to build a flying object using only the popular plastic bricks. Even though it seems difficult to do, a similar method can be applied to children with disabilities. Leading educational toy company Ravensburger proved it to be successful about a year ago: visually impaired youths now have the opportunity to learn the alphabet in a fun way, by using the world’s first 3D-printed Braille puzzle pieces, Fittle. And now it’s time for hearing impaired kids to get all the attention they deserve. Following the same “formula,” Huawei launched an interactive app which promises to help disadvantaged children and their parents spend some quality time together while being able to immerse themselves in the wonderful land of literacy. Titled StorySign, the app uses AI technology to translate children’s books into sign language. By using the brand’s clever tool, both parents and the little ones can discover how to properly communicate with each other. All, in a fun way! The company’s initiative is quite touching by itself. So, if you haven’t started to cry by now, hold on. You’ll probably burst into tears after you’ll see what the brand has prepared for us next. To promote this kind initiative, Huawei joined forces with award-winning, London-based agency FCB Inferno and Academy Award® winning director Chris Overton of the Dog Eat Dog (DED) production company to invite us all to “discover the magic of StorySign.” We have been given a unique opportunity to venture into this wonderful experience through a two-minute-long film. We won’t steal the joy of discovering the magical story by yourselves, so we won’t share any of its details. 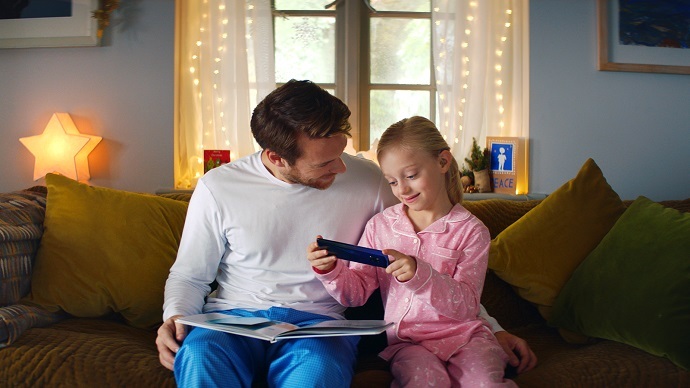 The only thing we will mention is that the video stars a 7-year-old actress Maisie Sly, the star of Oscar®-winning short film The Silent Child. Now, sit down, relax, and enjoy the short film. “We created StorySign to help make it possible for families with deaf children to enjoy an enriched story time. We hope that by raising awareness of deaf literacy issues, people will be encouraged to donate to or support one of the fantastic charity partners we are working with across Europe,” continues Andrew Garrihy, CMO Huawei Western Europe. To mark the clever app’s launch, the brand decided to surprise a group of deaf youngsters and their families with a once-in-a-lifetime adventure. Christmas is a different experience for hearing impaired children as they miss all the seasonal sounds, such as carols, jingles, and tales. Yet, they rely on their other senses to evoke the familiar holiday nostalgia. The good-smelling cookies grandma used to make or the image of Santa carrying his bag of gifts are just some of the things that remind deaf kids of Christmas. And that’s exactly what they got in Lapland, a place where Huawei’s big surprise unfolded. Here, the children were greeted with various activities, from storytelling to gingerbread making, carol singing, and could have a face-to-face meeting with Santa Claus himself. The app is free to download from the Huawei AppGallery and the Google Play Store in 10 markets across Western Europe. To bring the app to life, Huawei closely worked with experts and NGOs, including the European Union of the Deaf and the British Deaf Association. The first book available within the app is Where’s Spot with other books from Penguin Random House to be published soon.